Joining the artful blogging community has been one of the most fulfilling endeavors I have undertaken in years. It has taken my artful life and made it complete. I have always been a crafter, sewer, creator and artist since I can remember. My parents were very creative and allowed me the freedom to express myself and experiment since I was little. I started sewing at a very young age with needle and thread and received my first sewing machine when I was 8. I now end my days at my computer taking an infusion of inspiration from all the wonderful artists in this artful blog community that is worldwide. Blogging has provided a portal for connecting with artists worldwide that perhaps I see their work in magazines, eBay, etsy or my local newspaper. One of the sweetest and most generous of those is Jenny at Everyday is a Holiday. I think everyone out there knows Jenny and her partner Aaron. That is because they are talented, kind, generous and genuine. I first came to know them and their work through eBay. I have purchased several of their pieces which adorn my kitchen. Ironically, my first purchase from them was shortly after I moved away from Middletown, NJ. Middletown is right next door to their town, so we were practically neighbors! One of my jobs at that time was in the hospital in their town. Go figure! Swaps are one of the fun perks of blogging. You get to meet and exchange one on one with the wonderful bloggers out there. 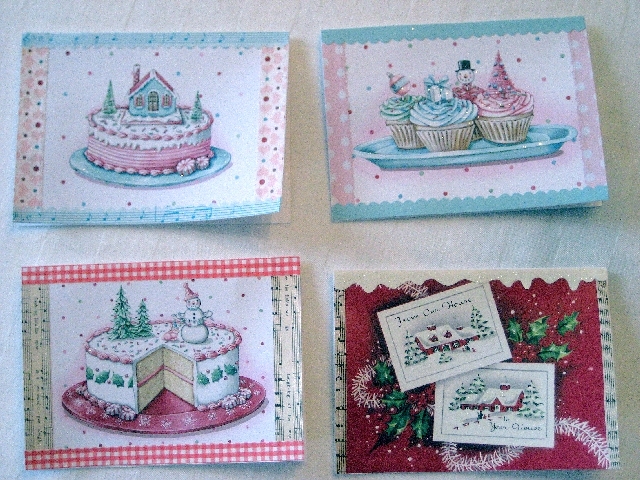 Most recently I participated in the Christmas in July Card & Tag Swap over at Angelina’s blog. Well, I was over the moon when I got my swap partner and it was Jenny! 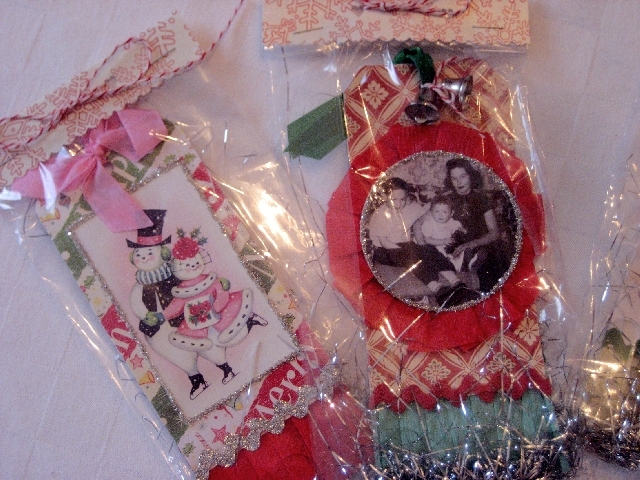 Check out these beautiful cards and tags. 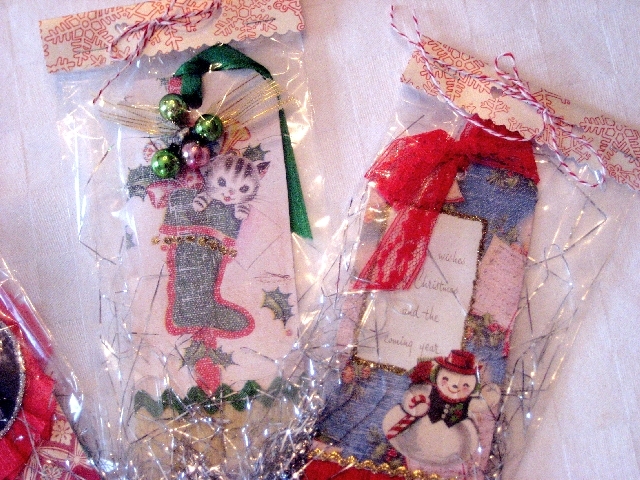 The tags are wrapped up so beautifully I can’t bear to take them out of their yummy packages! And as if that wasn’t enough Jenny and I did a little one on one swap too. I made her an apron and she made for me the most fabulous collage for my living room. I am redoing my living room to have a beachy, seashell, seaglass feel and color scheme to it. Jenny made this collage just for my room and I am thrilled to pieces over it! And to have an original piece from her is just the bomb! But it doesn’t stop there! Jenny also bestowed on me my second nomination for the Nice Matters Award. Thanks Jenny for your kind generosity! Simply FAB pieces Jenny made for you! Lucky girl!! Congrats on your Nice Matters award! And I completely agree about the wonderful blogging community. Such talent and inspiration is lurking around every corner. dude! you are one lucky girl! Wow, I’ve been out of the loop for a while now – what great adventures you have been having! I LOVE your idea about sentencing to wallpaper stripping – hilarious! 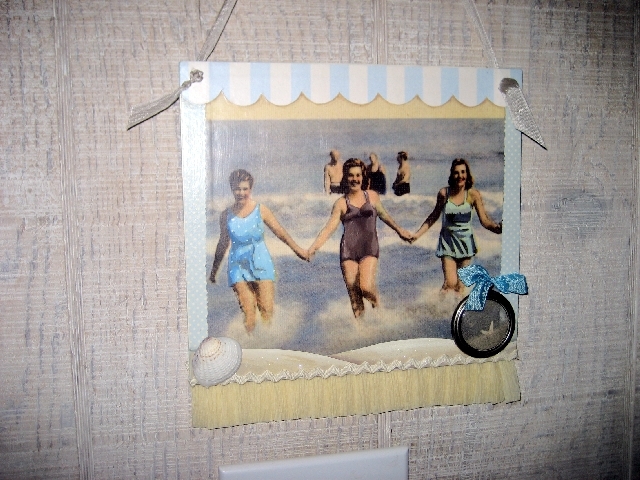 The tag sale looked fun – I’m hitting one with a friend this weekend for a b-day treat, can’t wait! As for swaps, it looks like you made out really well – congrats! Suzi- thanks for the comment- it led me to have an explore over here, so much pretty stuff to look at! Yes, Jenny is the sweetest for sure! She puts you in a good mood just by reading her blog! She’s the one I credit for getting me swapping and flickr-ing! Happy Birthday Suzy!!!!!! Love the pretty swap things you received!!! Aaah so you are a fellow Virgo!! !